Custom built to fit your application. 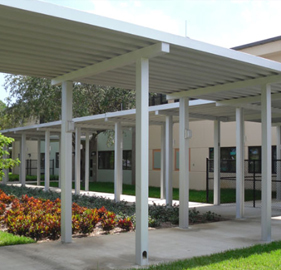 Perfection Canopy Systems provide long lasting protection from the elements, while harmonizing with nearly any architectural and site design. Our extruded aluminum systems Resonate Quality and Value from any angle. Design Team Professionals are ready to assist with a design that complements the aesthetics of your project. The Original, Rigid Roll Lock Deck System, recognizing a need for dependable deck systems in 1993, Perfection developed the original Rigid Roll Lock Extruded Aluminum Roof Deck. The performance of the deck locking system is often overlooked. Perfection's Rigid Roll Lock design insures that the deck components are securely attached to each other, eliminating potential installation errors and providing years of maintenance free service. 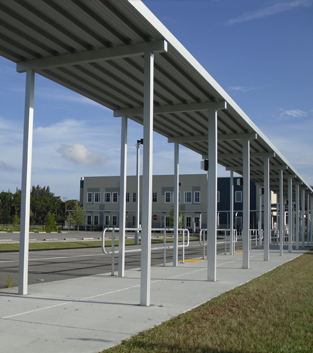 Our Rigid Roll Lock canopy systems have withstood the winds of Florida's toughest hurricanes. Other canopy deck systems are wedge locked or crimped together. These other designs allow for installation errors that won't be seen until the canopy is put to test by high wind force. Insure the long life of your project; don't settle for anything but Perfection Rigid Roll Lock Deck Systems. Key Design Elements are the mainstay of Perfection’s success in the walkway cover industry. 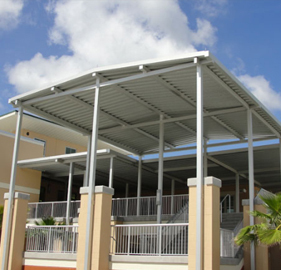 When you choose Perfection as your canopy provider, you choose a team of individuals who are dedicated to designing specific enhancements to your project, providing long lasting value, quality and aesthetics. 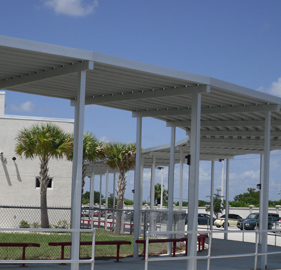 Our Premier Design Team is Ready to Help Create and Build Your Aluminum Canopy. Have questions about a design? Email us your canopy plan and we’ll help develop a canopy system that meets your requirements and all the structural standards of your local building depart. Perfection Walkway Cover Systems are available in standard and custom finishes. Select your finish based on the project location, finish durability and color selection. Click here to see a list of available finishes for all Perfection Architectural System products.